This delicious Goan Beef and Vegetable Curry is nutritious with the goodness of fresh seasonal vegetables. The curry can be mildly spicy to very hot and spicy. To increase the heat you need to retain the seeds of the chillies and be a little liberal with the ginger. It is always better to maintain a balance to get a lip smacking curry to enjoy, relish and above all to retain the taste of the meat along with the vegetables. The cooked meat should be tender and succulent and the vegetables should have a crunch but must still retain the fresh colors even when cooked. The tamarind and tomatoes add tanginess to the curry. They also enhance and bring out the flavors. The tomatoes help to bring out the rich red color along with the beautiful Kashmiri chillies. Whenever I prepare this curry, we enjoy it with steamed rice but relish it most with pav and the popular Indian Broon bread. I must tell you that it tastes awesome soaked in Broon. Those who have eaten Broon soaked in curry will recollect those precious moments of bliss! First, marinate the beef chunks with ginger-garlic paste and a little salt for about 30 minutes. Use a meat tenderizer as per instructions or use 1 tbsp. raw papaya paste; if needed. Heat the cooker body with a tablespoon of oil. Add the meat cubes and sauté to lightly brown the meat and seal in the juices. Add sufficient water to pressure cook the meat until tender. 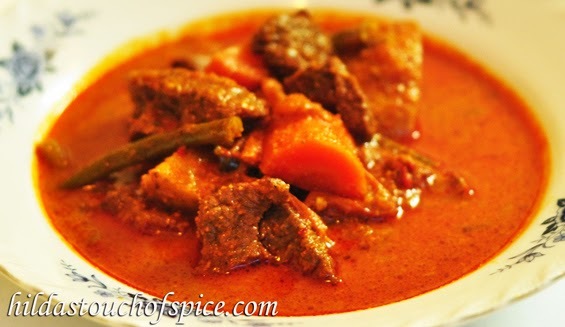 Separate the cooked meat pieces in a bowl and reserve the stock for the curry. Parboil the vegetables until tender. Do not overcook. Separate the vegetables in a bowl and reserve the stock for the curry. Lightly dry roast one ingredient at a time on a tawa/skillet/pan/wok/kadhai; kashmiri chillies, coriander seeds, coconut, cinnamon, cloves, peppercorns and green cardamom. Transfer the red masala paste to a bowl. Rinse the grinder and reserve the masala water in another bowl. Heat a deep and wide cooking pot or pressure cooker body with oil until hot. Reduce heat; first add the curry leaves. Then add the onions and sauté until soft and translucent. Add the prepared masala paste and sauté until rawness disappears and you see slight oil separation. Add the cooked meat pieces and sauté for a minute. Then add the parboiled vegetables and gently sauté for another minute. Pour the reserved meat stock, vegetable stock and give it a good gentle stir. Add water if necessary depending on the desired consistency of curry required. Add salt to taste. Let the curry come to a boil and then reduce to simmer. Taste the curry to check seasoning and adjust if necessary. Let the curry simmer for about 2-3 minutes. Switch off the flame and let the flavors meld for about 15 minutes before serving. Serve hot with steamed rice or with Indian bread of your choice. Loved the goan beef and veg curry. Turned out yum.